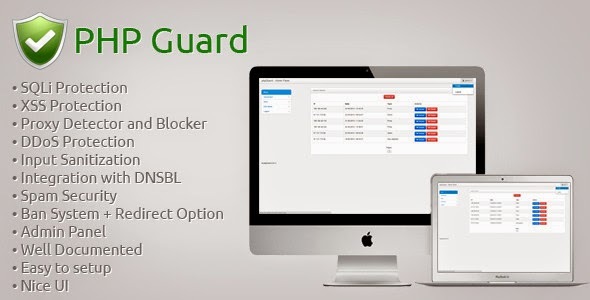 phpGuard is a script that will protect your site from hackers / hacking attacks. The script has the features to protect your site from SQLi (SQL injection), DDoS (Distributed Denial of Service), XSS (Cross-Site Scripting), Proxy and other types hacking attacks. A further feature is that it is integrated with one of the most famous DNSBL sites (Spam Databases), and if the spammer visited your website it will be blocked and forwarded to another page. Each hacking attack is stored in the database (no duplicates). The script contains admin panel from which you can browse hacking attacks and it is also integrated with Ban system through which you can view and ban users. Please note that not all proxies can be detected!